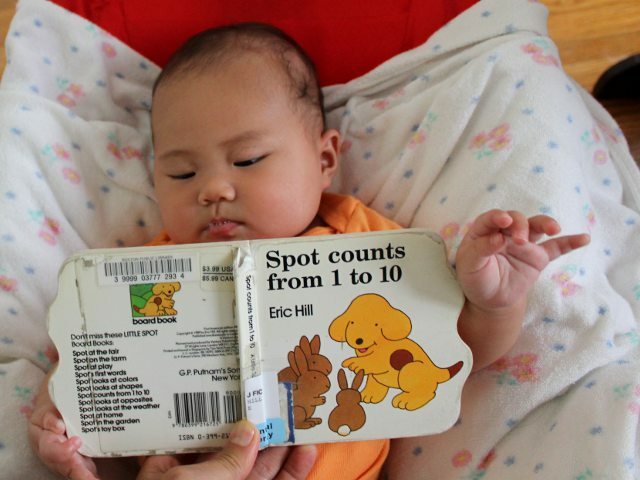 Since Arya has already shown that she likes books by Eric Carle, I am happy to read any of his books to my daughter. 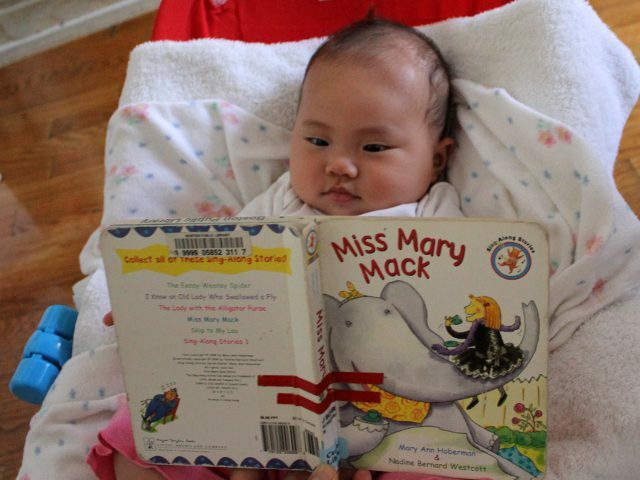 I should have waited to read My Very First Book of Words by Eric Carle until my baby learns to read herself. 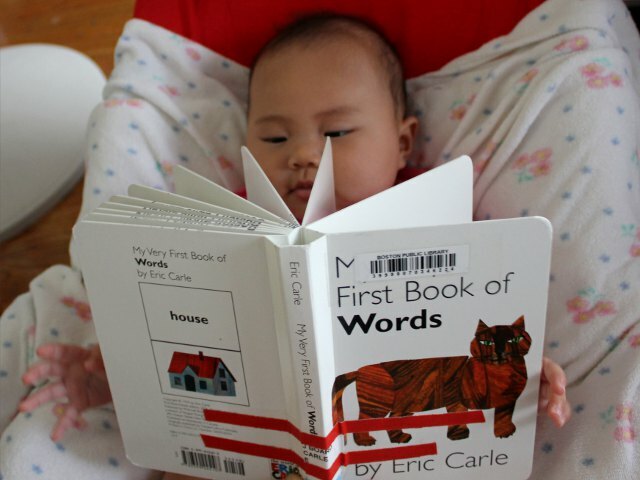 Although the book has 10 colorful illustrations drawn in typical Carle fashion, the text is designed to be a puzzle book for children to read themselves. My baby is getting better at tummy time. 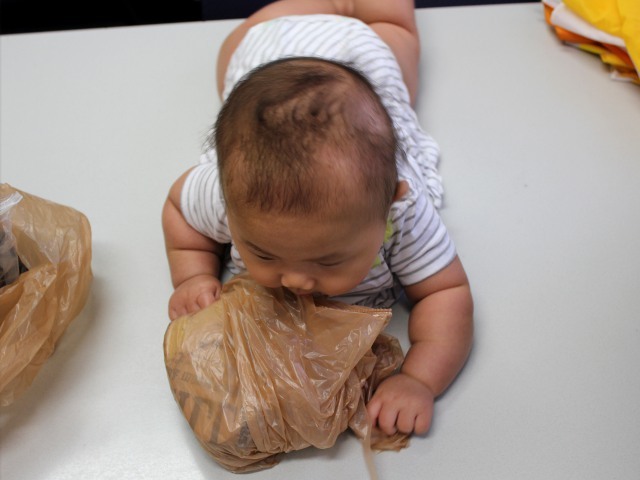 At five-weeks old she preferred wriggling like a worm and wasn’t enticed by toys like other babies. Now, we have gone from being fearful she would never like tummy time to bored since she takes so long during tummy time. Ever since she could do baby push-ups she spent longer and longer on her tummy. Now that she can touch her toes, Arya treats tummy time more as an excuse to play than as a baby developmental exercise. Arya met another developmental milestone this week. When Mommy woke up in the morning she walked out to find baby doing mini crunches in her crib and playing her toes. With baby touching her toes to entertain herself for half an hour we were able to get through breakfast undisturbed. Arya has finally found a toy she can use as a security blanket. Her Baby Winnie the Pooh Comfort Blanket is the ideal combination of a familiar character and a soft blankie. My daughter doesn’t use it all the time, but when she needs comforting or self-soothing she will consistently use her Winnie the Pooh blanket. Miss Mary Mack by Mary Ann Hoberman and Nadine Bernard Westcott is a children’s book based on a kids clapping game of the same name. I’d actually never heard of the song before looking up information about the book. 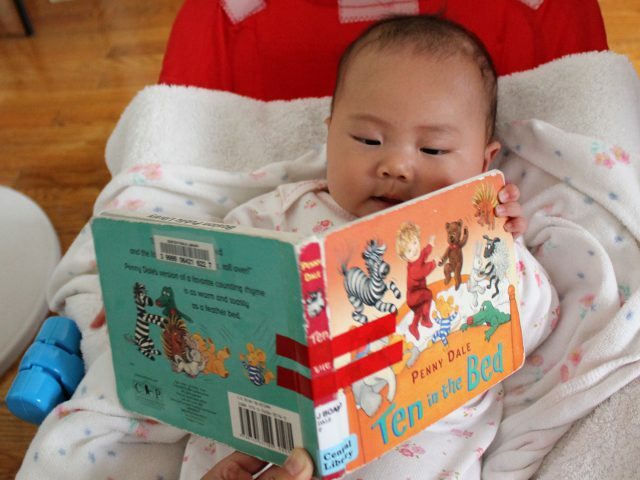 Although I never wanted to play clapping games as a child, Arya might force me to play some with her and reading these types of books will help me look less foolish when I begrudgingly play them with her. 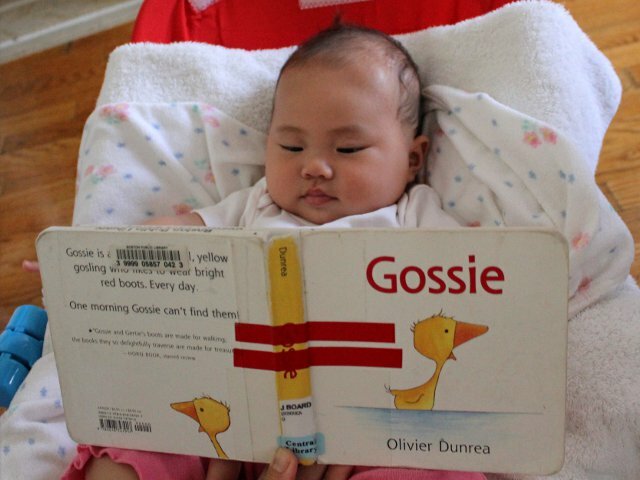 I enjoyed reading BooBoo to Arya, but I liked Gossie by Olivier Dunrea even more. Gossie is a cute yellow gosling who is actually the main character in Dunrea’s series of children’s books called Gossie and Friends. This book is the first in the series of dozens of books based on the yellow gosling and his cute animal friends. Ten in the Bed by Penny Dale is based on a children’s nursery rhyme. Dale makes two interesting changes to the standard rhyme. Rather than having “one” fall out, she creates nine distinct stuffed animals and one little boy for the ten in the bed. On each page, one of the stuffed animals falls out. On the last page, they all jump back into bed with the little boy. 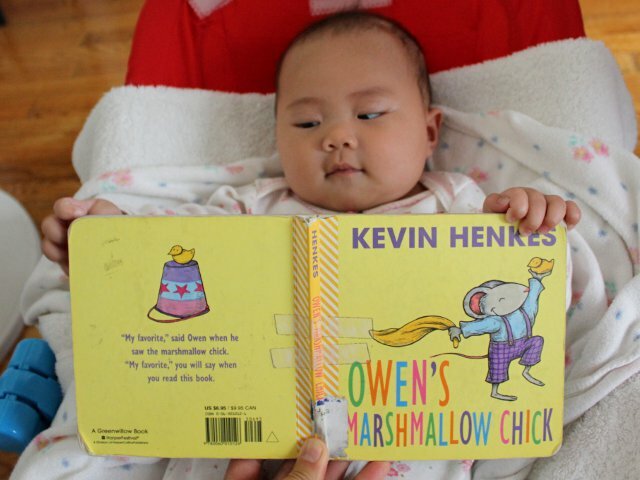 Having just read a different book by the same author to my daughter, I decided to read her Owen’s Marshmallow Chick by Kevin Henkes. As with all of his children’s books, Henkes combines colorful backgrounds, cute illustrations, and simple texts in this book. 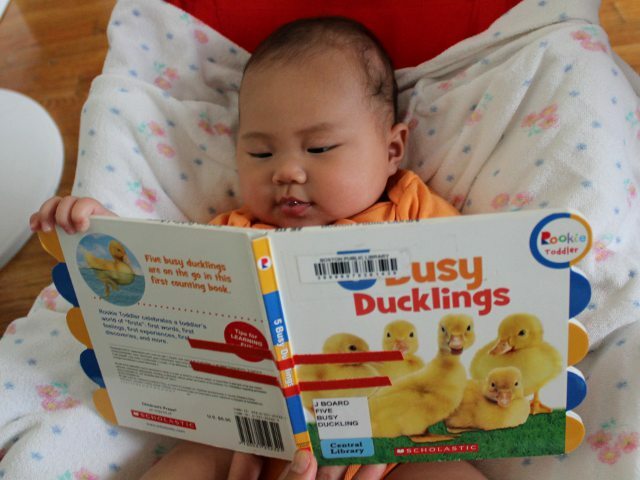 Arya was still too young to appreciate books during baby’s first Easter, but Owen’s Marshmallow Chick will be a great book to read to her around each Easter.